We’ve all had to move at least once in our lives, and one of the more arduous tasks when you move is making sure that you have enough moving boxes to pack everything. One of the worst experiences of my life during my last move was when I ran out of boxes and had to start purchasing them. I was amazed at the amount of money it took to purchase even a few boxes. Before I was done, I had easily spent $50 just on boxes alone! A very scary thought especially when you take into account the fact that you may not be able to do much with them afterwards — except recycle them. Let this be a lesson to those of you who know ahead of time that you are going to be moving. Start collecting boxes early! Let’s face it, free moving boxes are always the best. But what is the best way to get those free moving boxes, and what are the best kinds? My favorite boxes to collect when I am moving are the ones that reams of copy paper come in. You know the ones I mean… the ones that have lids, and are the perfect size for packing just about anything from books to cookware. Fortunately I worked in offices for years, and since I was the one who ordered all the office supplies (or I supervised whoever did), it was easy to collect those paper boxes and take them home for a few months so I’d have them for the move. Even if you don’t work in an office, chances are you know someone who does. Ask them to help you collect empty paper boxes for you. Or, you might consider stopping by an Office Depot, or Office Max and asking them if they have any empty boxes. They have to empty those boxes to put the reams of paper on the store shelves, and most likely they just get recycled anyway. So it never hurts to ask. While I’ve heard that asking for empty boxes at your local grocery store is one way to get free boxes, this in all honesty is my least favorite way. The main reason is that fruit boxes, for example, can have all kinds of nasty stains and residue inside them. Also, most of those boxes are not going to have lids, because the people unpacking the stock have cut these boxes open and taken off the tabs to get at the merchandise easier. As far as I’m concerned, no lids equals a bad choice of box because all your stuff inside can wind up all over the moving truck. But what if you just found out you have to move next week and don’t have the time to gather free boxes? Well, you can of course enlist the help of your friends and family, but it may be that it is too short of notice for them too. In that case, you’re going to need to buy moving boxes. My advice to anyone who is buying boxes for moving, is to avoid like the plague stores that specialize in shipping boxes. I’m talking about Mailboxes Etc. and Postal Annex and the like because most of the merchandise in these stores is going to be marked up pretty high. That’s where I got my boxes once, hence the $50 price tag. Later on, when I had time and I started looking around, I found that places like Fred Meyer’s for example had a small area with packing supplies, and boxes that were the same size as the ones I’d bought and were about 25% less than what I’d paid at the packaging store. Boy, was I steamed when I found that out! Boxes that can be securely closed are always your best choice when moving because you don’t want your stuff all over the place. And, if you or someone else drops a box, everything won’t go tumbling out on the street. That happened when I was kid, and believe me… watching the adults pick-up of all my younger brother’s toys on a busy highway was not my idea of a fun way to spend the afternoon. So, whether you choose free or purchased boxes, make sure they can be securely closed — even if you have to tape them closed. We all know that when moving, the boxes aren’t all that you need. In all likelihood, you will also need packing tape, markers, and maybe even bubble wrap — depending on how many breakables you have and if you want to wrap them in clothing or something else you have on hand to save money. 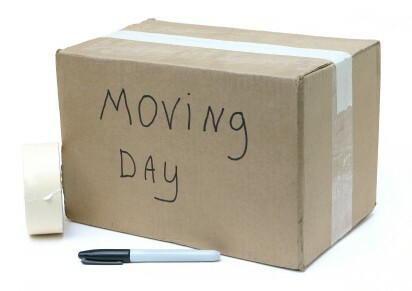 One way to help save on moving costs is to purchase your moving boxes and other supplies online. 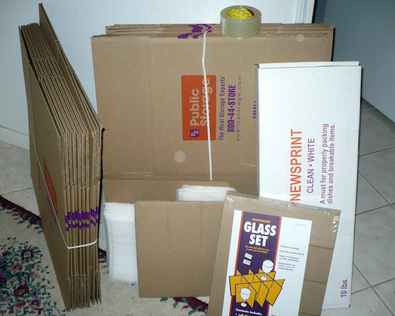 There are moving kits that you can order online that have a set number of boxes, along with packing tape, bubblewrap and markers. These moving kits can be delivered the next day, sometimes with free shipping. If you need the boxes and supplies right away this can be a godsend. Depending on what is in the kit, prices can range from $30 to $50 a kit, depending on the number of rooms that you are packing up. One drawback to the moving kits is that sometimes the boxes are all the same size, and if you run out of anything, you’re still going to have to go to the store to replace what you are missing. Another option is to visit your local dollar store. These days, you can find all sorts of things at dollar stores, including moving boxes, packing tape, markers, and even bubble wrap. While the items may not be only a dollar, generally speaking they aren’t more than a few dollars apiece. And while you get what you pay for quality-wise, if all you’re going to use them for is to pack items to move then this could work for you. 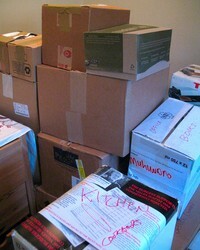 So, what do you do with all those boxes once you are moved? Well, that sort of depends on your whatever your needs are. Any boxes I purchased, I broke down and put in my closets against the back wall in the event that I or someone else I knew needed to move at a later date. You just never know if you or a loved one will have to make a move quickly, and you’ll be thankful that you have those moving boxes handy! As for the copy paper boxes with lids, I used those for storage. They fit on top of each other easily, and are still small enough that you can put them on your upper shelf in a closet or on the floor of the closet. I keep extra books, pictures, and knick knacks in mine. If you still have boxes left over, there’s always recycling! Along those lines, you might want to try Freecycle or Craigslist. I’ve seen moving boxes offered and received several times there. And both of those are specific to the area where you live.